Hate preacher Anjem Choudary has been jailed for five and a half years for drumming up support for so-called Islamic State (IS). His supporters in the public gallery of the Old Bailey courtroom shouted 'Allahu Akbar' as Choudary was sentenced. The British-born 49-year-old backed the terrorist group in a series of talks posted on YouTube, and recognised a caliphate - a symbolic Islamic state - had been created under an IS leader after it was announced In June 2014. Mohammed Mizanur Rahman, 33, was jailed for the same period for inviting support for IS between June 29, 2014 and March 6, 2015. 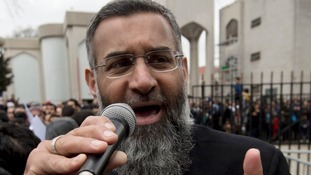 Hate preacher Anjem Choudary has been sentenced to five years and six months in prison for campaigning in support of so-called Islamic State. #Choudary given sentences of 5 years and 6 months. He was sentenced together with co-defendant Mohammed Rahman at the Old Bailey in London. Both men were convicted in July of inviting support for so-called Islamic State - an offence which carries a maximum sentence of ten years. Choudary, who was born in the UK and lived off benefits, was convicted after making a a series of speeches in support of IS which were posted on YouTube. He had previously managed to skirt the law despite being notorious as a hate preacher with a series of supporters who had gone on to commit terrorism offences. The court was told earlier today that Choudary regretted his support for IS as he had aimed to act with the law but "on the boundaries" of what was allowed. "He is determined not to cross those boundaries in the future," his barrister had said.